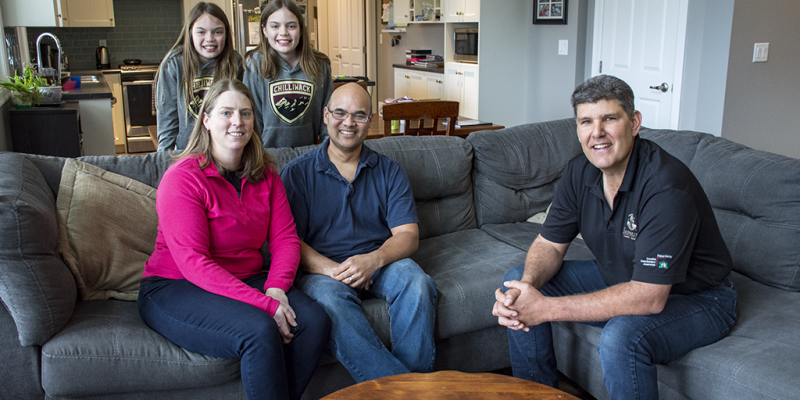 Home Designer Archives - Sonbuilt Custom Homes Ltd.
A few days ago we stopped in to visit Wil and Sara and their twin daughters, Marlee and Paige. We first met this family back in 2014. At that time they were excited to build their dream home in Ryder Lake near Chilliwack, BC. They really wanted to build a High Performance Home. Clean, fresh indoor air was a high priority for them as allergies were a concern in their family. We designed and built a two story home with a basement. The large open kitchen and great room are ideal for sharing meals together and family time. A spacious laundry room contains a wide bench with plenty of hooks for hanging sports gear, jackets, and back packs. The girls were thrilled to have their own bedrooms and were allowed to choose the paint colours. The open space in the basement has space for indoor sports and lots of storage. Their home is very energy efficient! It is built to the R-2000 Standard making it 50% more efficient than homes built to the standard BC Building Code. In the winter, the warm air stays in the home and in the summer, the home is cool and comfortable. Wil and Sara shared a story about a power outage that took place a few months after they moved into the home. It was below freezing outdoors and after several days of no power, the home dropped one degree! They are very pleased with how cost effective the home is to heat and cool. We completed their home in 2016 and it was fun to catch up with them at their home to see how they are doing. This latest Sonbuilt Fraser Valley project is all about doing a demolition responsibly. We are re-purposing as items in the home as possible by reusing many materials in the new build and recycling the items we don’t use to ensure they don’t end up in a landfill. As a team, we are tackling this home as a “dismantling” project, rather than attack and destroy. Each item is carefully uninstalled and analyzed. If it can be reused in the future home, we will wrap it for storage. Some items are being donated to charity. Others are being sold on social media. Recyclable materials will be sorted through responsibly. As much as possible, we are avoiding the garbage bin. We are enjoying this challenge! Stay tuned for updates and photos! We are very excited to be in the Fraser Valley Home and Garden Expo in Abbotsford at Tradex on February 8 – 10! Come visit us at booths 212, 213, and 214. This Fraser Valley based show has a vast array of both interior and exterior products for your home and features a number of landscaping, remodeling, interior design, and home construction companies from areas throughout Greater Vancouver. Click here for admission prices and show info. We at Sonbuilt Custom Homes would like to take a moment to wish you and your family a very Merry Christmas and Happy New Year! 2019 is already shaping up to be a busy year for Sonbuilt! This past fall we have worked diligently at completing the site services at THE VINE at Pepin Brook. We are excited to be starting construction in the Spring. If you are looking to have a home designed and built, be sure to contact us early in the New Year. All the best this Holiday season! And … a big thank you to all of our customers, staff, trades and suppliers! We couldn’t do this without you! It’s the most common question we are asked. A classic Rancher floor plan combines the kitchen, great room, 1 or 2 bedrooms, laundry room, and all other essentials spaces for daily living on a single level. The home may include a basement below, or a games room above. Ranchers are ideal for those ready to downsize after the kids have left home. Perfect for one level living, yet still maintaining plenty of usable space for visiting grandchildren, entertaining friends, and weekly family dinners. Several years ago we won 2nd place in a Canada wide competition for accessible housing. This home, the Panama, was designed and built specifically for a “young at heart” couple who planned to live in their Sonbuilt home as long as possible. It was their final home. To see photos of this home, click here. Do You Want to Live in a Rancher? Are you thinking about downsizing and plan to make your next home your “final” home? If so, let’s make that home a place where you can live independently and safely as long as possible. We call this “Aging in Place”. Click here to find out more information on what we design into our homes to ensure the home is safe and smart for long term living. YES! We do build ranchers! Contact us today for more information! Make sure you have fresh air circulating in your home. While it’s exciting to set up a freshly painted room, ensure that paint is dry and cured before using it. Rotate your shower curtain regularly and avoid ones made from vinyl as they do become moldy quickly. Visit our webpage on the High Performance Home to learn about building a healthy, energy efficient home. It’s a busy season here at Sonbuilt Custom Homes! We are working with Marv’s Excavating on the site services for THE VINE at Pepin Brook in Abbotsford. Things really got rolling back in August. We closed down a section of Merlot Boulevard in Pepin Brook to install the services for the 3 lots that front onto Merlot. A big thank you to all of our Pepin Brook neighbours for your patience in choosing a different way around the subdivision! We are so thankful for the smooth process of closing that road. Right now, a section of Merlot is patched up with black top. It won’t be too much longer and the road with be repaved and looking new again. Abbotsford’s newest road, a cul-de-sac called Corvina Court, is in the process of being completed. This street will be the front for 13 of the lots at THE VINE. Marv’s Excavating is currently in the final stages of smoothing out the gravel road and paving should take place soon. Curbs are scheduled for this week. We are so VERY fortunate to have such beautiful weather to work in! We were able to screen much of the dirt we have dug on the site. By screening the dirt, we are able to remove the waste material like pieces of stumps and concrete, and reuse the dirt that actually makes it through the screen. View a video we made HERE to see how the screener actually works. Using this screener has probably been our favorite part of the process so far! If you drive past the site (located at the corner of Ross Road and Simpson) you will probably get an idea of the lot sizes and overall layout. In the coming weeks it will become more obvious. Be prepared to see some actual real estate signs in the next month or so! Speaking of sales, we are now selling homes for THE VINE at Pepin Brook. Whether you are looking for a rancher, a two story, or a fully custom design, we are able to accommodate your dream home. Contact us today with your questions! Building a new custom home is an exciting experience, but it can also be a little intimidating. An important first step in building a home starts with choosing your builder. Often, folks begin their initial questions to a potential builder by asking about cost per square foot and whether or not they can supply their own trades or suppliers to save money. These questions only scratch the surface on what a homebuyer should consider to ensure a positive building experience. Can I walk through some of your recently built homes and meet the owners? Who will be in charge of building my home each day? A dedicated lead carpenter assigned specifically to your home from groundbreaking to finish will be able to consistently answer your questions throughout construction and maintain communication with scheduled trades and suppliers. While there can be occasional lulls in the process, your go to person will always be available to keep you updated on the timeline and anticipated progress. Are you a member of your local Home Builders’ Association? As a member of a Home Builders’ Association, your builder has committed his or her self to a Code of Ethics which is based on principles of fairness, integrity, and client satisfaction. Membership is an indication of professionalism, dedication to the business of home building, and planning to be in business for the long term. What is your home building experience? It takes dedication and commitment to stay current with all the details of building a solid home. Whether a builder has 5 or 25 years of experience, a good builder will honestly share details of his or her business background, construction training, and what sets him or her apart from others. An experienced builder will confidently tell you what he or she can do for you and for how much. How often will I receive an updated budget and schedule? Let’s face it, your most valuable commodities are your time and your money. A common complaint made by many homebuyers is that they are frequently unsure of how much money is still needed for completion and how much longer the construction will take. By staying in touch with your budget, you will be able to make ongoing decisions on materials and finishes. Regular schedule updates will assist you in knowing when to anticipate completion. An important key to a smooth construction project is a builder who provides ongoing, easy to understand reports to clients. Choosing the right builder is just as important as choosing the right design for your home. A good relationship with your builder will last long after the home is complete and throughout the warranty period. Sales are Starting at THE VINE! WE ARE READY TO START SALES AT THE VINE!!! Check our website www.sonbuilthomes.com/thevine for floor plans. We’ve released several floor plans including a couple of designs featuring Master on The Main, as well as a 2 story home. We have a couple more designs to release in the coming days. Check our website for more information. If you’ve driven by the Abbotsford site over the past couple of weeks, you’ve probably seen the changes taking place. We have begun preparing the site for services like water and power. It won’t be long and this Fraser Valley site will be ready for 16 high performance homes. We’ve also added a lot of information to our website included colour palettes, interior finishes, exterior options, high performance home information, and warranty information as well. Feel free to browse through the various web pages and give Surinder a call if you have any questions. The support and encouragement we have received from our neighbours here in Pepin Brook has been incredible! Thank you! Looking for an Update on Progress at THE VINE? READ ON! We’ve been busy. There are numerous “behind the scene” tasks that take place when completing a development of any size. THE VINE is no exception! We are excited and moving forward. Give us another few weeks or so and the site will begin to change dramatically. We are aiming to start home construction later this year. After a few months of avoiding the rain and clearing the land we are happy to announce that all of the major trees have been fallen. We are excited to move on to the next stage to prepare the land for 16 beautiful high performance homes. Abbotsford City Council approved our proposal to rezone the land for THE VINE, meaning that THE VINE is officially on the map to occupy single family residential homes! We would like to thank everyone at the City for being so helpful and encouraging as we move forward with our project. The design guidelines determine the finishes and overall character of the homes to be built. These guidelines have to be approved by the City before we can begin taking initial deposits for specific lots for custom homes. We anticipate these guidelines will be submitted to the City in the next few weeks. Our webpage for THE VINE will be getting some updates soon. Click here! Actually, we’ve prepared a lot of information on the back end of this website and everything will be made live in the near future. Check back often and while you are here, feel free to look around and discover some of our other pages such as our vlog “New Homes Built Right”. 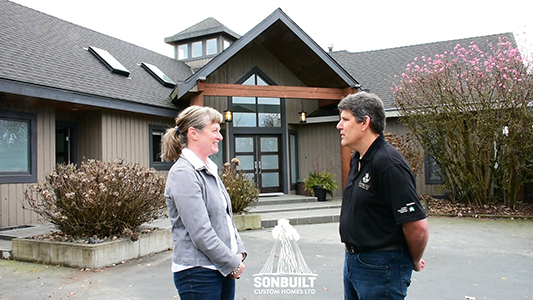 See just what it is that sets Sonbuilt apart from other builders. If you have specific questions about the lots and homes, or want clarification on any details concerning THE VINE, please feel free to contact our RE/MAX realtor, Surinder Sarowa at (604) 825-3962 or at Surinder’s website www.sarowa.ca. He is more than willing to assist to the best of his ability. That’s it for now. Stay tuned! Thanks for your interest in what we do! Copyright © Sonbuilt Custom Homes Ltd. Site built by SuzAnn. All rights reserved.